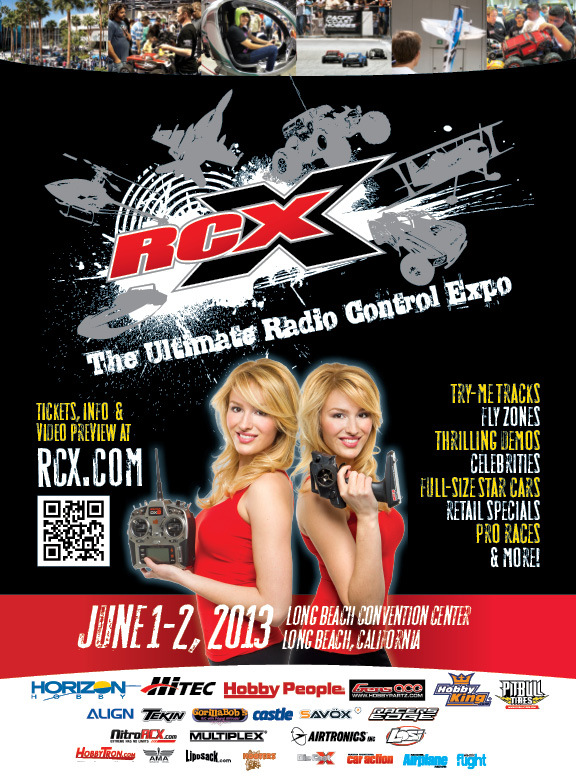 If you happen to be in the Long Beach CA area this weekend June 1-2, 2013 be sure to check out RCX 2013 at the Long Beach Convention Center. This year’s event features an Off-Road “Try Me” Track, “Try Me” Fly Cage and a Phoenix Flight Simulator all sponsored by Horizon Hobby. There will also be a Pit Bull Tires Rock Crawl Mountain and Full Scale Off-Road Racing Vehicles both sponsored by Pitbull Tires. The expo will also have an indoor flight zone, a boat bash and a helicopter simulator. This is only the tip of the iceberg there are so many more attractions, something for every RC Enthusiast. You can check out RCX.com for more details. We were hoping to have our ace reporter Steve on the scene, but it looks like he will be helping some family members with a roofing job.